Yarn and Fiber Happenings: Easter Bunny Surprises $$ on Every Purchase and Knitting with Friends T-Shirt Event! Easter Bunny Surprises $$ on Every Purchase and Knitting with Friends T-Shirt Event! 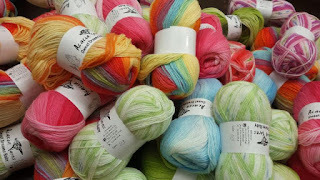 To our surprise, when we arrived today, the Easter Bunny has left a basket full of eggs that contain a special surprise for all our wonderful customers who shop over the next three days at The Yarn and Fiber! The Easter Bunny left us a note saying, if you make a purchase, you get to pick a lucky egg that contains a special discount just for you! Easter Egg pickings are Thursday, Friday and Saturday of this week! See you soon! Don't live locally? Enjoy our Easter Egg Special receiving 15% off all online orders through Sunday at midnight! Simply enter coupon code EASTER at checkout and your discount will apply to all instock purchases. And, the fun is just beginning! Join us on Saturday, April 19th when the really cool, creative minds behind the Knitting with Friends, Crocheting with Friends, Spinning with Friends, and Quilting with Friends fun t-shirts will be here to create custom shirts and bags for you featuring the fun-loving sheep, alpacas, llamas, yaks, bees, and more. Pick your shirt color and graphic and your T-shirts will be created for you onsite! Special pricing applies to all shirts - $15 for one shirt or two for $25 for Short Sleeve T-Shirts and Long Sleeve Shirts will be $18 for one or two for $30. Or you may choose to have the KWF folks put a graphic on shirt or a tote bag you already own for only $5 per graphic! Knitting with Friends will be here all day on Saturday - so come and have some fun with us!